(NOT SCD Legal) Illness, aging, poor nutrient intake, and use of certain medications can result in inadequate production of CoQ10 to sustain optimal organ function. 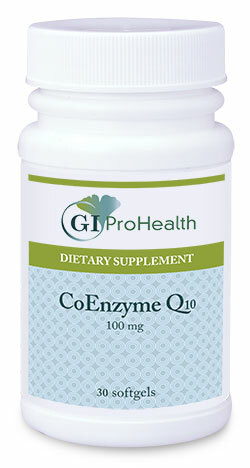 The heart muscle, periodontal tissues, immune system, liver, kidney, brain, and other vital organs require Coenzyme Q10 (CoQ10) to supply energy and to help protect them from radical damage.These convenient softgels supply 60mg of pure coenzyme Q10, a fat soluble nutrient, solubilized in a base of rice bran oil and vitamin E, also coenzyme Q10 produced through a pharmaceutical manufacturing and extraction process is used in GI ProHealth’s supplements. CoQ10 is available in 60 mg and 100 mg softgels. Suggested Use: 1 to 2 softgels daily with food. Or as suggested by your healthcare provider.